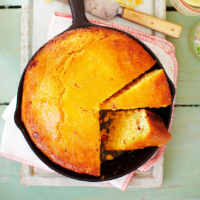 Southerners continue to debate the perfect cornbread recipe – with or without eggs, flour or sugar – but the idea of adding bacon is always a winner. If you’re vegetarian, this version is just as good without the meat. 1 Preheat the oven to 200 ̊C, gas mark 6. Chop the bacon as finely as possible (use scissors if it’s easier). Fry in a 20cm ovenproof frying pan until golden – about 5 minutes, then remove with a slotted spoon and dry on kitchen paper; set the pan aside. 2 In a large bowl, mix together all the dry ingredients. In a separate jug, beat the buttermilk, egg and maple syrup, then whisk into the dry ingredients along with the bacon bits. Stir through 3 tbsp melted butter until combined. 3 Add the remaining 1 tbsp butter to any leftover bacon fat in the frying pan; heat until foaming. Tip in the batter and smooth the surface with the back of a spoon; bake for 20 minutes. Meanwhile, make the glaze by melting the butter and maple syrup together. 4 Brush ½ the glaze over the top of the cornbread, then return to the oven for another 5 minutes. Remove from the oven, brush over the remaining glaze and allow to cool for 10 minutes before slicing into wedges and serving while still warm. This recipe was first published in Fri May 01 14:40:00 BST 2015.